Being committed to something for one year is a feat. Continuing to commit for a second year is a doubling of that feat. But when you’ve been keeping on for three years you’re kinda just…keeping on. And once you reach this milestone which isn’t a milestone (given that three-year anniversaries of anything are largely unrecognized), you may wish to take stock of what continuing this commitment has meant to you, and what it may mean going forward. I am doing this now. 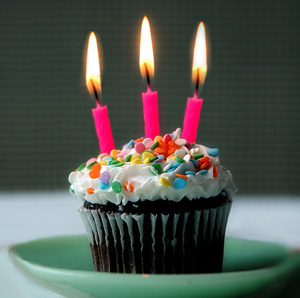 In preparation for writing this “three-year bloggerversary” post, I decided to look back at my very first post, published on this site on November 29, 2010. It is called, rather embarrassingly, NiftyNotCool: A Whine and Cheese Introduction (I assume because it’s whiny and cheesy? ), and I read it in the hopes of discovering what had changed for the blog between then and now. I expected to laugh at the silliness of me, the way I do at my diaries from junior high or the letter I wrote at 12 to myself at 16. I have recently had to pull myself out of a pit of gloom and crankypants behaviour. Ah yes. The “pit of gloom and crankypants behaviour.” In other words, I had a broken heart (I was not willing to admit this on the blog at the time because I wanted, and still want, a blog that is not about my love life). Even prior to the breaking of my heart, I was completely and utterly intellectually bored in a way I have never been bored before, and consequently angry most of the time (this was the crankypants behaviour part; the gloom was the sadness that rode on my shoulders for months and months). In the inevitable period of self-reflection that has followed, I have realized three things. Thing One, I need something to occupy my mind, and make use of the brains that have been growing lazier and lazier since I finished my undergrad. This part is true. My world had gotten a lot smaller since completing my BFA, and, as I said, I was bored. Thing Two, spending the day in my pajamas and refusing to leave my bed because the world makes me sad is not helpful to anyone, and the only way my whining could be construed as slightly beneficial to the world is if it is presented in a structured and (hopefully) well-thought-out manner. This part is also true. As much as I definitely possess a left-leaning bias, and as much as I don’t have the time to research all of the issues I write about as much as I’d like, I have generally tried to be thoughtful in expressing my opinions. I’m not sure if my “whining” is beneficial to civilization at large but since I am blogging about the things that upset me instead of leaving vitriolic comments all over the internet like other angry bored people I believe it has been, at the very least, less harmful than the alternatives. To address Thing One and Thing Two, I decided that I might like to take a crack at blogging. For a 24-year-old I am ridiculously technologically inept, and if I don’t hop on a computer now and use it to do more then check my e-mail and watch the Rick Mercer Report, I might never know how to use one again. Again, this is untrue. I am not technologically inept. I like technology and use it all the time at work and am generally good with it. Rather than being technologically inept, what I really am is skeptical, especially when it comes to social media. It’s not that I don’t or can’t understand the technology. It’s that I don’t care to be on the cutting edge of its implications–I don’t need it to change my world. I’m happy to let the first users work out the bugs and join the party when it’s in full swing and there’s no getting around it. For example, though I love my iPhone, I’m still not 100% sure that having one has been good for me. My decision to try writing a blog…brought me around to realizing Thing Three: I am not cool. The second half of this sentence is true. I’m not cool. But this wasn’t something I first realized when I decided to write a blog, I’d known this for a long time. I decided to write a blog because I am not cool and I felt this uncoolness in a very deep and personal way. The blog is called “NiftyNotCool” in an attempt to own my lack of cool (and because the websites “When this Blog Rolls Over” and “I Am a Dinosaur” were already taken). My social-media moniker has had the unintended consequence of leading people to believe I am more self-deprecating than I actually am, and even Raffi, bless his heart, has taken the time on Twitter to tell me he thinks I’m cool so I won’t feel sad for myself (thanks Raffi!). Now that I am no longer broken-hearted, and now that I am no longer bored (working full time and studying English on the side have pretty much made boredom a luxury), my original reasons for starting a blog (i.e. “Thing One” and “Thing Two”) are no longer applicable to me. I also have no plans to monetize the blog or use it in any direct way to further a career. So why do I keep on? Make no mistake: blogging is work, and it must be admitted that in a middle of a busy week the last thing I want to do is blog and even now I just wish I was going to sleep instead of sitting on my bed with my laptop heating up my thighs and my restless toes wiggling in my peripheral vision. There have been many times when I have thought to myself, why am I doing this? Why don’t I just stop? I wondered if my three-year bloggerversary would be a good time to call it quits. Even now, as the clock nears 1:00 a.m., I am wondering if quitting after this post would be a good idea. But I don’t think I will. I have posted at least once a week EVERY week for THREE YEARS and I’m not sure I want to break this streak just yet. Though I don’t always have much time to write (and occasionally not much to write about), when I do have something I really want to say I want my platform to be there for me, and I want the precedent I have set to motivate me. If I decided I would just post whenever the heck I felt like it, I would never post anything. I would keep putting it off and putting it off until the issue was no longer relevant and then feel bad about myself for not saying something I wanted to say. Though my readership is small, I feel a responsibility to them as well. When I read a thoughtful comment or hear from a friend or acquaintance that something I wrote touched them, I feel great, and humbled, and glad that I have this blog. I recently read a blog post by author Kim Thompson, the gist of which is that if you don’t have anything to blog about, don’t blog. While I am fairly suspicious of the merits of “content generation” for its own sake (especially as part of a business model), I think there is a difference between simply “generating content” as a product, and writing as a process. My blog is a process. I might not begin the week knowing what I’m going to write about, but I know I’m going to write. The wheels keep turning and as I write I get better at it. Though I’m not happy with everything I post, the fact that it must go up means that I can’t give in to the paralyzing fear of mediocrity, and as an artist, this is one of the most important tools I can have. If I twiddled my thumbs and waited for my masterpiece to come along, it never would–there would be no foundation for it, no process through which to manifest it. NiftyNotCool is a process. This virtual person who tweets and blogs and tries to be good and oh-so-clever. Her virtual heart isn’t broken anymore and she no longer needs her self-deprecating virtual armor but I’ve become fond of her. We’ve come this far and there’s still no end goal in sight. Which is fine, I guess. Life is a process and the blog is part of it. It may change someday; it may get a new look or a new name or a new medium. I may not always be able to post as often as I do now. But it’s not really the blog itself that matters, it’s the process. Three years from the first step, and I think I finally figured out why I keep going.